Hello dear reader. Today, I decided to go in a different direction than I've ever gone. I am branching out, and trying a new poetry form. It is called a poetry blitz. The blitz is meant to be read quickly, leaving yourself only time to breathe. 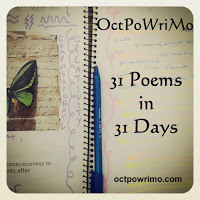 As I read more of these over the course of #OctPoWriMo, I have found that I really enjoyed them. That was my motivation to try. I did try to include some of the word prompts / feeling prompts we were given. At the end of the blitz, you will find a link. This link is actually the first part of the prompt for today. We were challenged to publish an audio recording of ourselves reading one of our poems from this month. I have decided to accept this challenge, but I am reading a poem I wrote in in January of 2013. It is a piece that was inspired by the songs of Tom Waits, but don't tell him that. He may not like what he did to my words. And, as promised, here is the link to my reading of Pub Night. Yay Rod, you added a good blitz to the collection! It's an interesting form to try, isn't it? I'll be listening to your reading tomorrow, I don't want to put my headphones on in the living room tonight. Thanks Angela!! I loved writing the blitz (I actually wrote 2). I hope you like the reading...it's only the second time I've ever tried it :-). Thanks for stopping by the site!! I love the blitz poem and great job on the poetry reading! Ah the Blitz, it is one of my favorite forms, well done! Thank you so much for taking up the challenge of reading your poem aloud and sharing it with us. You took me right to that pub as if I was sitting there watching and listening to everything going on. Great job! Thank you so much, Morgan! I'm honored that you enjoyed both pieces!! Thanks for the prompts, and for the inspirations! Wow, great blitz! And I enjoyed the reading too.